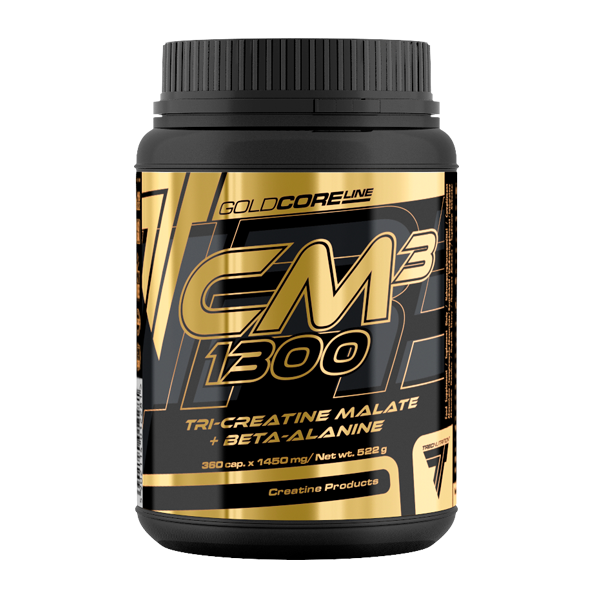 GOLD CORE LINE CM3 1300 is a product containing crystal pure tri-creatine malate and beta-alnine. Regular supplementation with 3 g of creatine daily increases physical performance in successive bursts of short-term, high intensity exercise. GOLD CORE LINE CM3 1300 is recommended as a product which helps to achieve the top condition, especially in power as well as power and speed disciplines. Take a single serving of the product – 3 capsules, wash down with approx. 300 ml of water. Take 2 servings daily. On workout days: 1 serving in the morning after getting up, 1 serving 30 min. before the training or 1 serving immediately after the training. On non-workout days: 1 serving in the morning after getting up, 1 serving between meals or 1 serving at bedtime. INGREDIENTS: tri-creatine malate (71,3%); beta-alanine (13,8%); capsule shell (gelatine; colours – titanium dioxide, patent blue V); anti-caking agent – magnesium salts of fatty acids.